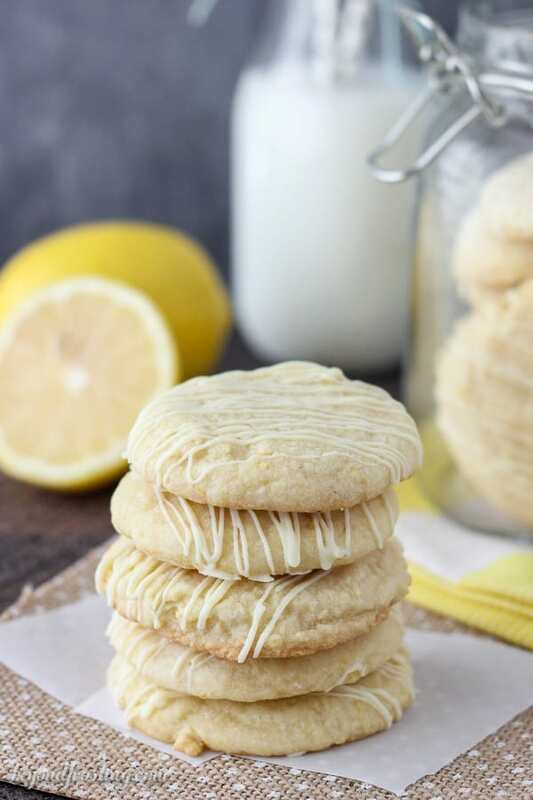 These Lemon Cake Mix Cookies are just what you need to brighten up the day. 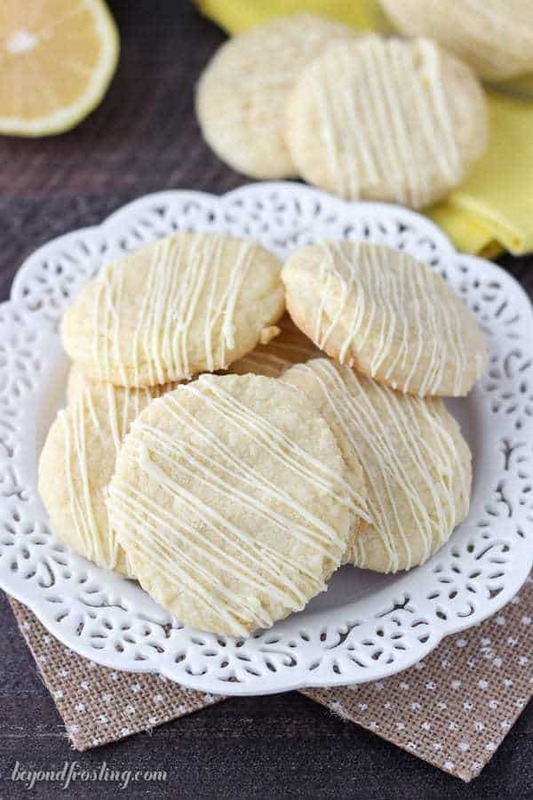 These lemon infused cookies are made with a lemon cake mix and drizzled with white chocolate. How was your weekend? I know it’s already Wednesday but with Monday being a holiday, my whole week is a bit thrown off. Sunday was Valentine’s day and we spent a quite day at home. My boyfriend made us tacos for dinner and I popped a long-awaited bottle of champagne. We finished off our evening with the mid-season premier of walking dead. I know what your thinking, we’re so fancy, right? What did you all do? Monday I stayed in my PJ for most of the day, working on more updates for my cookbook and ate pizza for dinner. Overall I would chop this weekend up to a huge success. Tacos, pizza, champagne and PJs. Besides all that, I also got a ton of work done. Today it’s back to my strict diet. I do owe you guys an update on my progress. It’s going well! The hardest part by far is when I am baking. It is very difficult to resist tasting everything and a bite or two really adds up. I mean, I made 4 different cheesecakes this weekend. Yes 4. 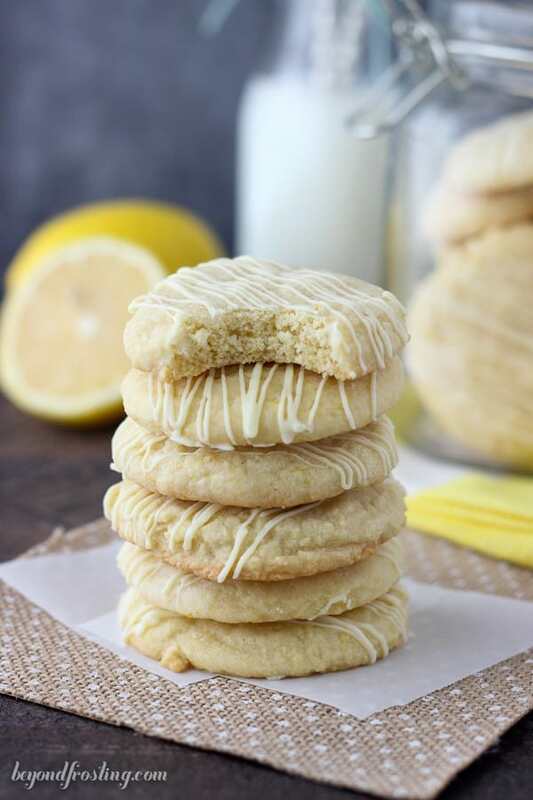 After a long weekend break, it’s finally time to share these Lemon Cake Mix Cookies with you! It’s true, I’ve been hanging onto these for quite some time now. I figured since it’s in the high 80s here, our winter had suddenly flown out the window and it’s straight up summer time weather right now. It is the perfect time to share these. I think by now you know that I’ve got a hankering for cake mix cookies. They are super soft, usually chewy in the middle and crispy on the edge. I’ve done red velvet and I’ve done chocolate, now it’s time to make a lemon version. What makes these lemon cookies a little extra flavorful is the lemon zest I added to the cookie dough batter. It gives these cookies that extra zing that you want in a lemon dessert while adding a bit of freshness. 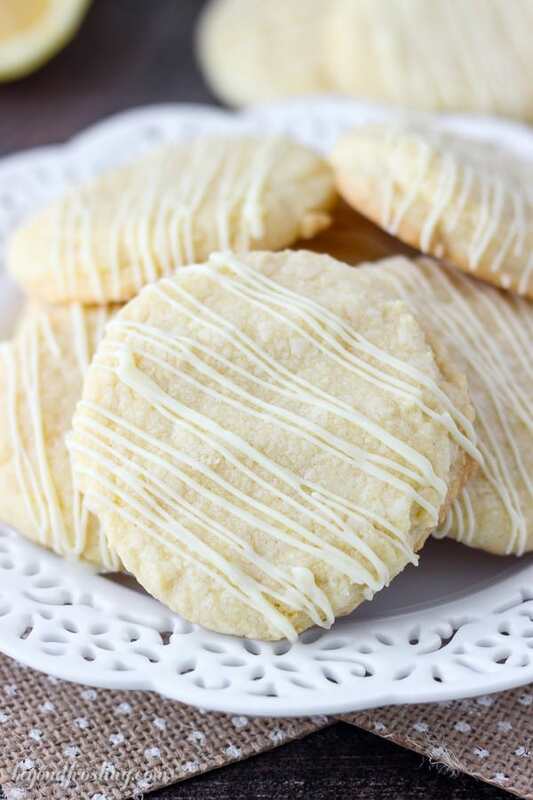 These lemon cookies are drizzled with a white chocolate glaze. It’s nice to have a little sweetness to offset the tartness from the lemon cookies. It the perfect way to balance out these cookies. You could also stuff these with white chocolate chips if you felt so inclined. I first shared this recipe for Lemon Cake Mix Cookies over at Food Fanatic. I will be contributing there monthly shares all kinds of cake mix concoctions. You guys know that I love cake mix because you can get very creative with it. It helps take some of the guess work out of baking. Everyone likes to have success in the kitchen right? Well I look forward to sharing more of these cake mix recipes with you this year! Hi. I love this! Gave it out to my friends and they love it too. Thank you for sharing! Question, how long is the shelf life of the baked lemon cookies? Should I store it in the fridge? Or chiller? Hi Rica, You can keep it in the fridge if it is really warm outside, but otherwise you can store on the counter top. I usually keep for 3 days, or you can freeze them and eat them as you want! What a clever recipe! Congratulations on a terrific cookie! And congratulations also on a truly eye-catching site. You photographs are really lovely, and everything sounds so good! You’re too kind Joanne. Sometimes I don’t even believe it’s real! These cookies look so good! I have never baked cookies using a cake mix, so I need to try it soon. Also, I am looking forward to your cookbook! Hi Linda! Well that’s so kind of you. I am really trying to stick with it this time, but around this time of year is when I need to get through the hump so to speak. Okay, so for these cookies, I use a cookie scoop and then I actually flatten the top a little bit, and that’s why they look more flat. If you don’t press the top down, they will end up with more of a dome shape. Also you can refrigerate the dough before baking and that should help to! Sounds good. Pizza, cheesecake, champagne…. I made 2 cheesecake (tested I should say) and it took about 2 days to clean up. So worth it though! I can’t imagine 4; just the juggling of all the ingredients and NOT tasting every 10 seconds. Thinking of your impending cookbook! Hi Berta! First of all, that sounds delicious! I have never made a cake mix cookie from only a cake mix, but I have seen it done that way. For my cookie I incorporate some of the cake mix into the flour. So it results in a cookie that is a little “puffier” than normal. I hope you will give it a try and let me know what you think! Sounds like a fun weekend! I can’t even imagine trying to watch my weight with all those yummy treats around! Oh man, it’s hard but I am seeing success on the scale so I am determined to stick with it!